The Ledyard Canoe Club (at Dartmouth College) invited me to speak at the second Ledyard Explorers Symposium on April 21, 2018. It was an honor to be invited to talk alongside legends like Wick Walker and to hear about some of the deep history Dartmouth has in the whitewater slalom and downriver racing worlds. 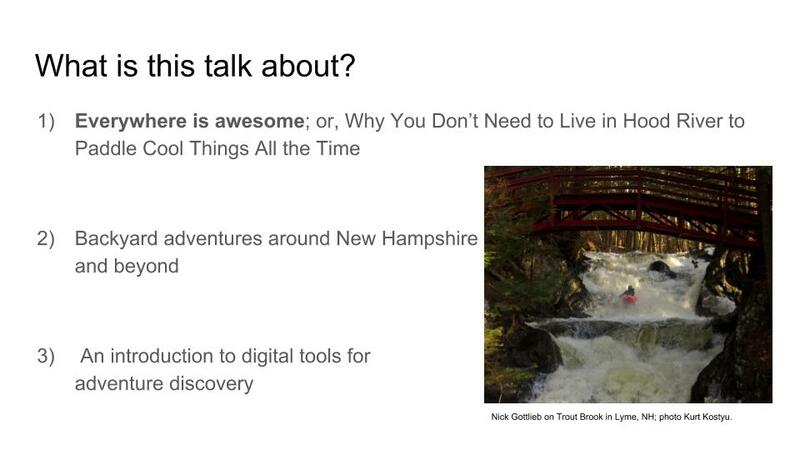 I gave a talk about finding local adventure no matter where you live and how to use modern tools to help generate unique experiences. The text and slides of my talk are below. I’ll introduce myself briefly. 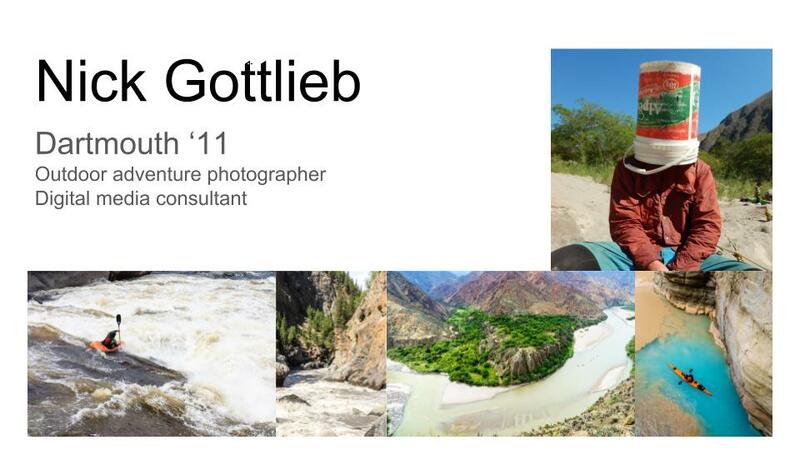 I graduated Dartmouth in 2011, I’m an outdoor adventure photographer and digital media consultant. I’m humbled to be included in this group and am not sure I have been on any expeditions that put me in the same category as these folks, but I’ll mention a few of my more notable trips. While at Dartmouth, I was part of one of the last descents of the Romaine River in northern Quebec, a huge wilderness river that is now inundated by four mega-hydro projects. In 2015, I was part of a 30-day trip down the Rio Marañon in Peru, the largest tributary of the Amazon, during which we filmed for a documentary and gave presentations to local communities about the potential impacts of planned dams on the river ecosystem and their lifestyles. I’ve also kayaked all over North and South America and done many multi-day trips, including paddling the Grand Canyon of the Stikine in northern British Columbia. I didn’t think going through photos and giving a long-form kayaking trip report would be that meaningful, so instead, I’m going to talk about why everywhere is awesome, how your backyard, wherever that may be, is full of adventures, and how to utilize modern tools to find that adventure. I’ve lived in a handful of places and traveled through many more, and the opportunity for adventure is pretty much omnipresent. This beautiful double drop is just a few miles from the Dartmouth Skiway on Trout Brook. 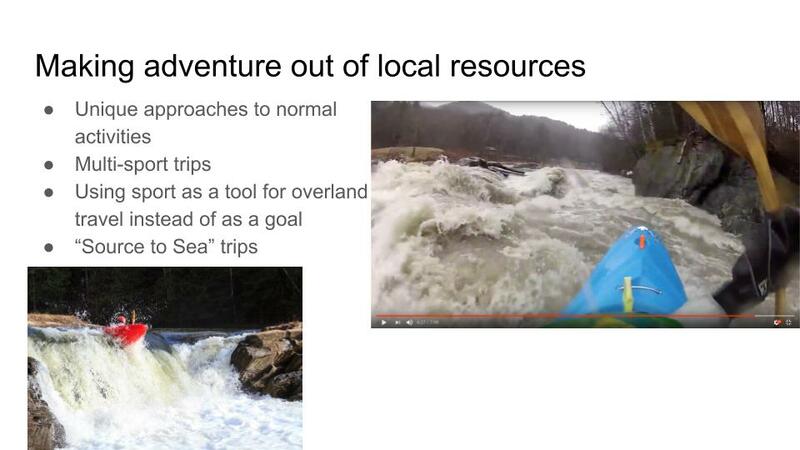 Since Ledyard invited me here, I’ll try to focus this talk primarily on kayaking and river trips, but the points apply to outdoor recreation in general. 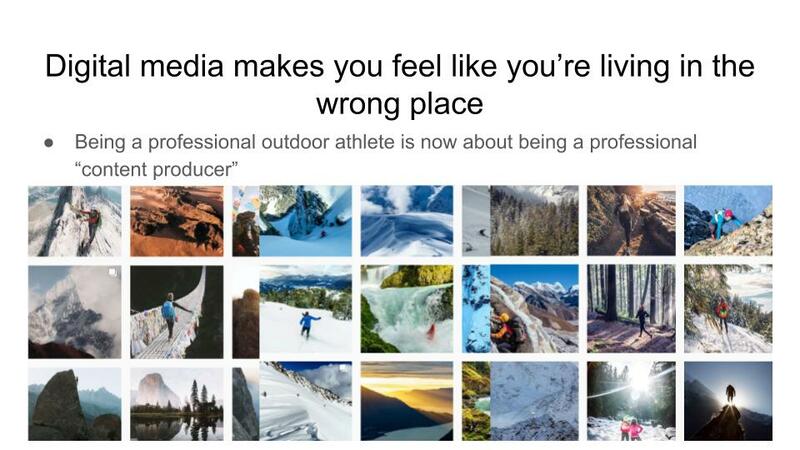 Digital media has created a world where outdoor athletes can share what they’re doing in real-time, and professional athletes are becoming professional content producers. As a result, we’re constantly exposed to imagery showcasing the most epic expeditions and places in the world and it’s easy to feel like whatever you’re doing isn’t adequate. This isn’t entirely new — kayaking and skiing, in particular, are both really prone to the feeling that you’re never in the right place. You’re always wondering if the water level would’ve been better somewhere else…the difference is that now, you’re constantly seeing images that reinforce that idea. The reality is that you can find adventure just about anywhere. Four of these photos are from within a few miles of places I’ve lived. The one on the left is Bloods Brook in West Lebanon, NH. 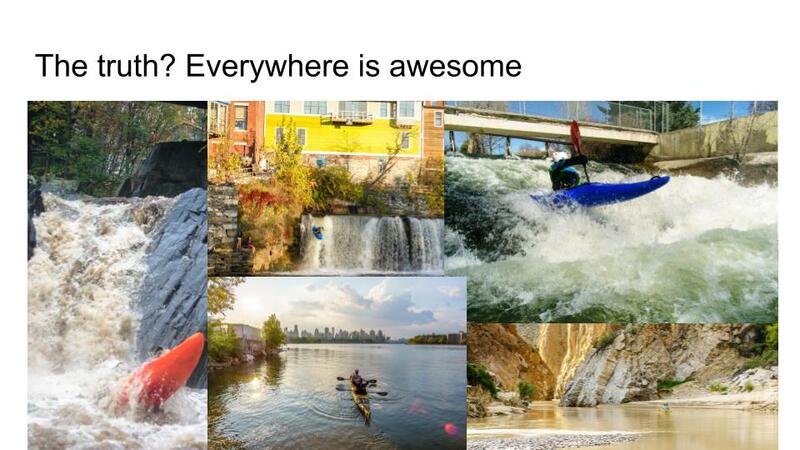 It might not seem like it when you come here for school and everyone’s talking about how good the skiing or kayaking or whatever is “Out West,” but Hanover is surrounded by incredible rivers, trails, and mountains. The top photo is in downtown Middlebury, VT. The bottom one is circumnavigating Manhattan by kayak. I grew up in New York City, and while I’ll readily admit I’m not about to move back there, there are some amazing rivers and trails pretty easily accessible from the city, not to mention unique trips like the one pictured. The top right photo is from the Logan River in Utah. Those of you who have been to Utah probably know this…but the state is really not known for its whitewater. But when I moved there, I discovered there were sections of the Logan you could paddle pretty much year-round, and to top it off, I could walk to one of them from my house. The last photo is from Big Bend, National Park on a trip with Dan Reicher a few years ago. I’ve never lived in Texas (and don’t plan to), but it was pretty easy for me to write off as a state until this trip. It turns that out even the oil fields of West Texas have some pretty impressive stuff in their backyard. Since we’re here in Hanover, I wanted to focus a bit on some of the more interesting trips I found while I lived here and to try to inspire some ideas for future firsts and expeditions in the area. People have been kayaking in the northeast for a long time, and most rivers and creeks were first run decades ago, but there are so many streams and waterfalls around that finding new ones just requires some legwork and desire for adventure. 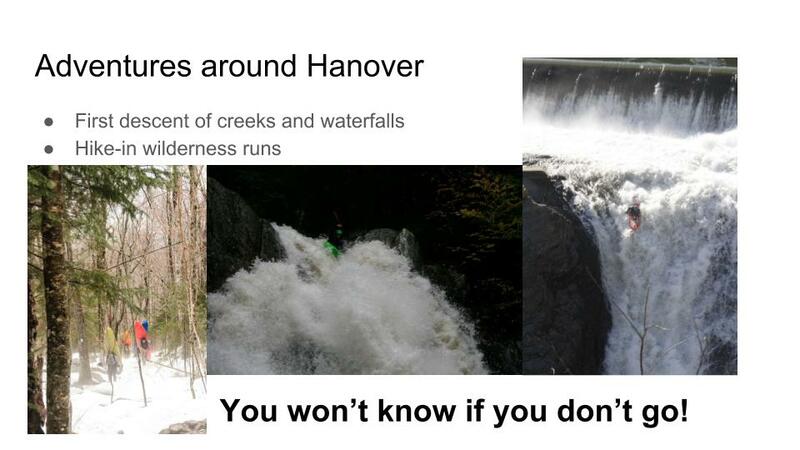 I did multiple first descents within forty minutes of Hanover area. I won’t say anyone should repeat my descents of Indian Pond Brook or Bean Brook — but they’re up past Orford if you’re curious. There are plenty more drainage ditches to first descent, but there are also opportunities for real wilderness trips close to home. In 18 years of kayaking, I’ve only been “benighted” — or spent the night out on the river unintentionally — twice. Once was in Mexico, and once was an hour and forty-five minutes from here on the North Fork of the East Branch of the Pemi in early spring. The Whites and the Adirondacks both have a number of opportunities for remote wilderness paddling trips and there are definitely some missions that haven’t been attempted. Some for good reason, perhaps. There are other ways to push yourself and challenge the unknown than just doing first descents, and you can make otherwise mundane things into exciting trips by using atypical approaches. Some friends just finished a 10-day raft trip on the Middle Fork of the Salmon in Idaho. If you’re familiar with the Middle Fork, that might sound pretty mundane. A bit long, but mundane nonetheless; thousands of people raft the Middle Fork every year. The difference? These folks did it in March, with skis, and backcountry skied in mountains so deep in the Frank Church Wilderness that they’ve likely never been skied before. I find that the more I use sport — kayaking, skiing, whatever else — as a means of overland travel rather than just pursuing it for its own sake, the more incredible and unique places it can take me. We live in an age when many of the “firsts” have been done, but when you change your approach, you can still generate unique experiences. One of the most unique paddling trips I did while living in the Northeast was paddling “source to sea” on the Mad River in Vermont — from Granville Gulf to its confluence with the Winooski; we started in a drainage ditch on the side of Route 100 and ended on a huge river in flood, passing two ski resorts and four towns along the way. The Lower Mad on that day was the biggest volume whitewater I’ve paddled in New England. For those of you who still live in the area, I’ll give you a teaser of some of the paddling missions that would be at the top of my list if I still lived here. First and foremost would be taking advantage of high water to do some source to “sea” trips on some of the longer rivers. 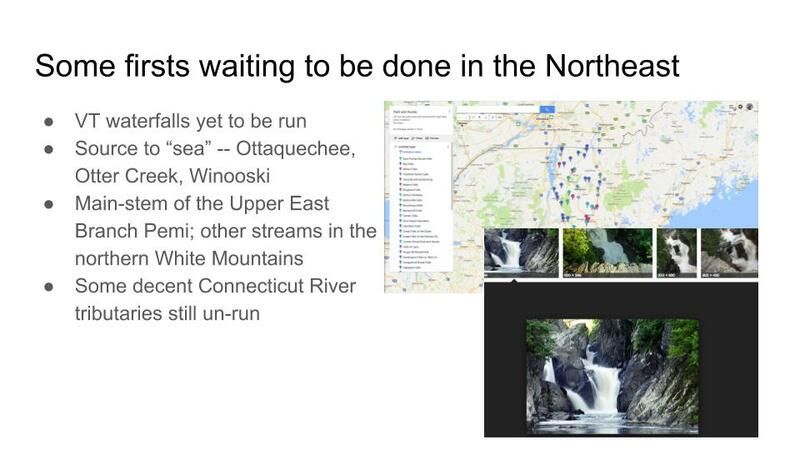 The Ottaquechee is one close to home that’s just begging to be done and would be a great day-trip filled with whitewater. Otter Creek and the Winooski are both high on my list as well. They’d be multi-day trips with a lot of flatwater, but would take you across huge portions of Vermont and give a whole new perspective on the state. The Pemi would be a good one, too. The North Fork of the East Branch of the Pemi has been done a number of times, but there are likely some other tributaries in the drainage that you can hike into, and I’ve always wondered what’s at the headwaters of the Swift, just over the gap. I could go on all day about this — I’ve wasted a lot of time on Google Earth — so just find me at the reception if you want the full laundry list or access to this map of Vermont waterfalls. In addition to being a great way to waste time, Google Earth is one of the most valuable tools out there for finding adventures. Yes, it’s hard to find firsts these days, but at the same time, we have a better toolkit available for doing so than we have ever had before. Google Earth (or Google Maps) is generally my starting point for any sport — the satellite imagery and built-in topographical information gives you a good overview of the terrain or river. The canyon pictured here is on the Stawamus river just 6 miles from my house in Squamish, British Columbia. It’s definitely never been kayaked and there’s no information about what’s in there on the internet. When the snow melts, I’m looking forward to a heinous BC bushwhack to go see what’s going on up there! 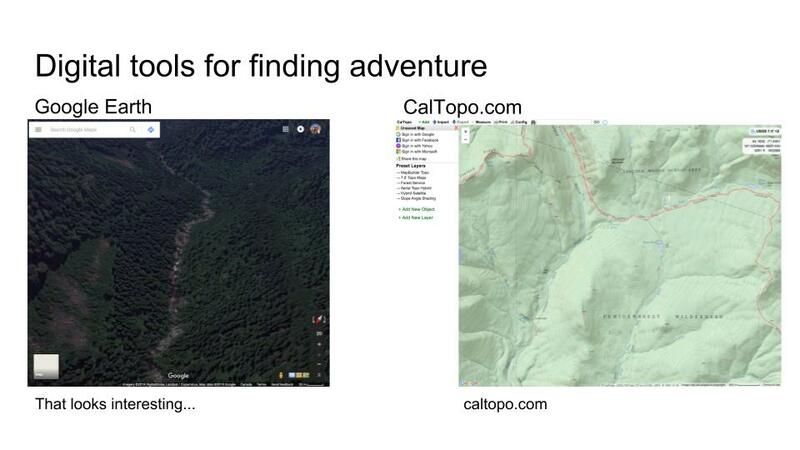 On the right, I’ve got a screenshot of CalTopo which is another free tool that gives you access to Forest Service topo maps and other useful layers. It’s showing the North Fork of the East Branch of the Pemi and you can see the two possible access routes — Zealand Notch and Ethan Pond. Had we been using this map when I did this trip, we would’ve realized that there’s a sustained steep section of river below Thoreau Falls and we wouldn’t have wasted a couple hours trying to access the river immediately below the falls; we might even have avoided getting stuck out for the night. 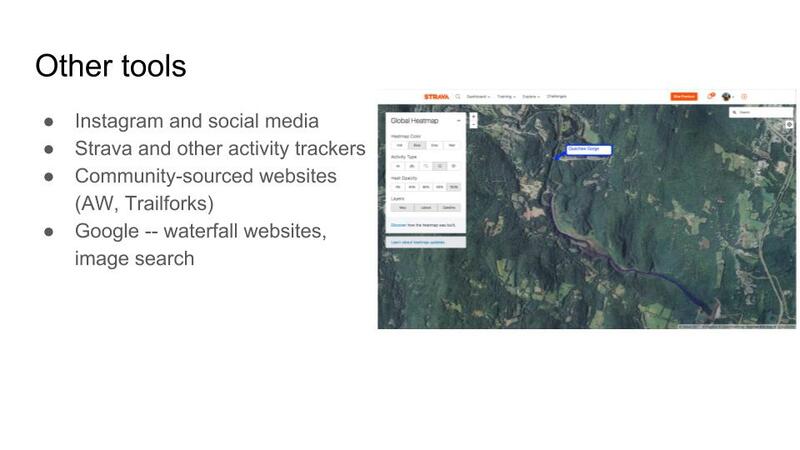 There are a lot of other tools out there — I regularly use Instagram and social media, Strava, and Google to find more information about areas or to follow up on a hunch I have based on maps. We have more information at our fingertips than ever before, and you can use that to help you find and plan unique adventures. 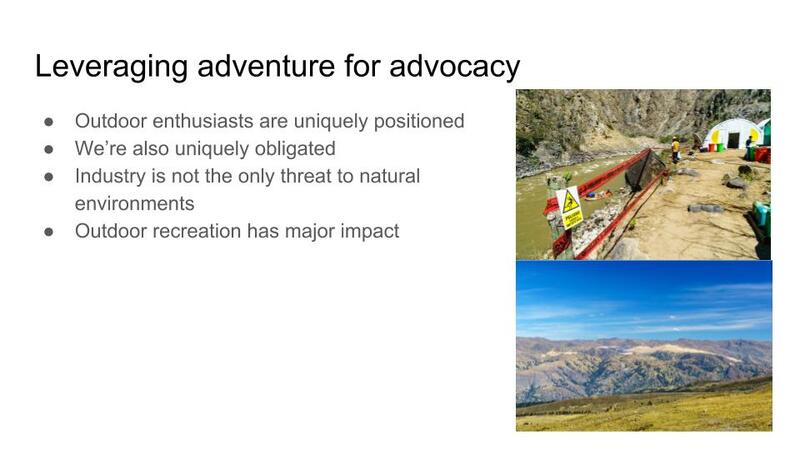 This really warrants its own talk, but I wanted to leave off with a short message about how intertwined outdoor adventure and advocacy are. As recreationalists and adventurers, we’re both uniquely positioned and uniquely obligated to be stewards of the natural world. By visiting these remote and inaccessible places, we can get a first person view of industrial development that is “out of sight, out of mind” for other people. I’ve encountered this with dam sites on the Marañon in Peru and the Romaine in northern Quebec and with mining in northern British Columbia. It’s important to share images and stories about these places whether they’re actively threatened or not in order to keep them from being forgotten and then exploited behind our backs. That said, it’s also important to recognize that outdoor recreation is not unequivocally good — we can have just as big a negative impact on natural resources, and I’d encourage everyone to focus on minimizing the impact of their own personal recreation as well as on the bigger picture issues involved. Thank you for having me, it was an honor to be invited back here to speak and it’s great to see how far Ledyard River Festival has come in the decade since we started it! Great thought – provoking talk Nick. I can use your tips for checking out hikes in Scotland.